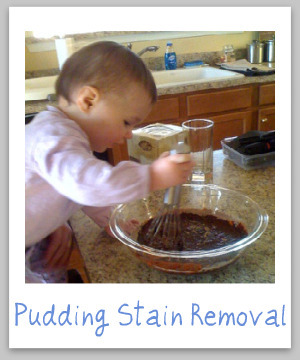 Pudding stain removal tips and techniques come in handy if you are as brave as the parents in the photo below who allowed their little girl to help make the pudding. 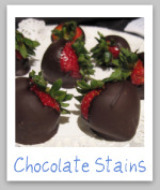 Plus, it's chocolate pudding in the picture, no less, which is generally the hardest pudding stain to remove. 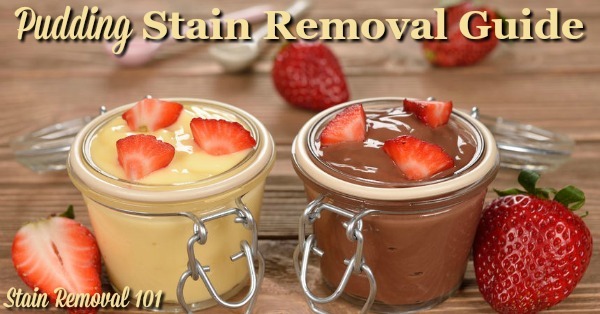 The directions below will work, generally, for removing most pudding flavor stains, such as vanilla, butterscotch, rice, banana, pistachio, and of course chocolate pudding stains. 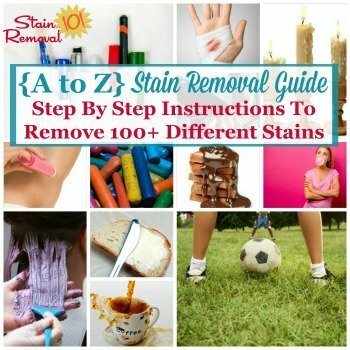 Note however, that if you have trouble with these general stain removal directions below you should consult the A-Z Stain Removal Guide for the specific ingredient contained within the pudding spilled for more help. 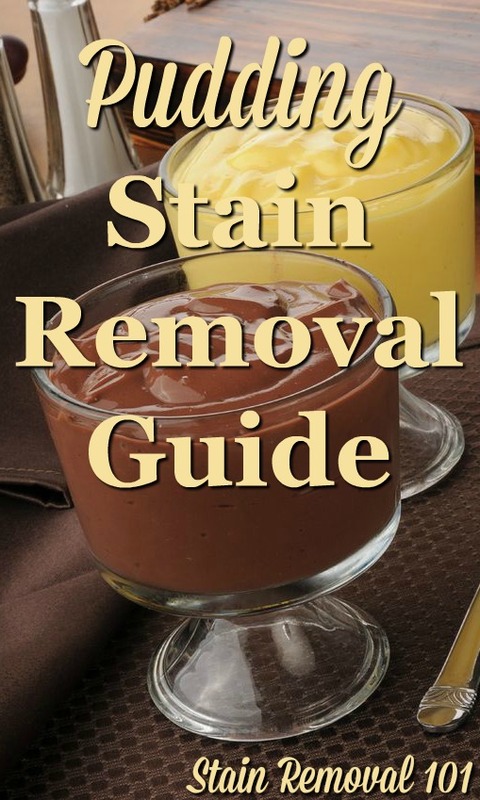 Step 1: Scrape off any excess pudding from the fabric, being careful not to spread the stain further. Step 2: Run the fabric, inside out, under the cold water to flush out as much of the pudding as possible. 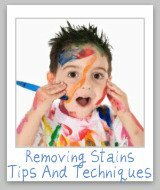 Step 4: Launder in the hottest water allowed for the fabric to thoroughly remove the pudding stain, using either chlorine bleach if the fabric will allow it, or color safe bleach if not. 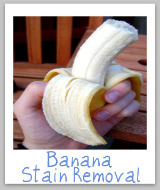 Step 1: Scrape off any excess pudding from the upholstery, being careful not to spread the stain further. 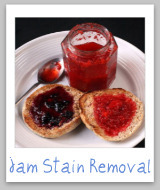 Step 3: Using this solution, sponge the stain from the pudding with a clean white cloth. Step 5: Repeat steps 3-4 until the pudding stain is removed from the upholstery. 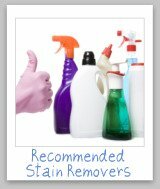 Hint: Be sure to get the upholstery only as wet as necessary to remove the stain from the pudding. 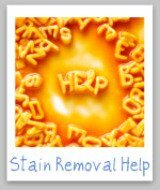 If this pudding stain removal method for upholstery does not work you can also try removing the stain with dry cleaning solvent. 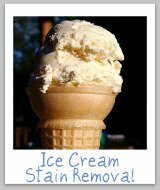 The instructions for pudding stain removal from carpet is the same as for upholstery. 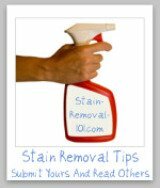 However, if you don't have luck with these stain removal methods above you can also do something additional with the carpet stain, which is to mix a solution of one tablespoon of ammonia with two cups warm water, and use this to remove the stain.